Clearing out a small room in our house that has been used over the years as a baby’s bedroom, an office, a spare room and a storage space. Amongst the accumulated objects, clothes, CDs, books, videogames, pictures, etc. that was a large box stuffed with electrical leads and computer cables. Rummaging through for power leads and connectors that might still be useful (HDMI, USB, etc.) I was struck by an odd unfocused and diffuse nostalgia. Some of the leads were affectless and useless – bland black plugs, tangled plastic-coated cables and jacks of now obsolete formats. Others though reminded me of media setups of the past: numerous RCA configurations that linked games consoles, mivi-DV cameras and DVD players to each other and to TV sets. 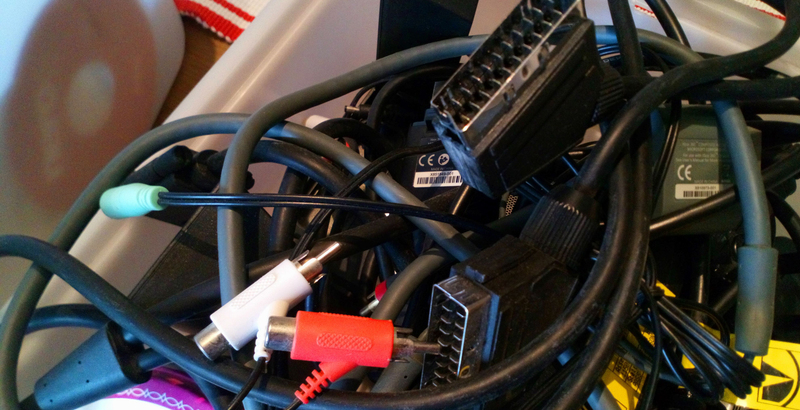 Then a number of Scart leads, and Scart plugs with sockets to couple with older RCA systems. No specific memories, no moments – rather a nebulous sense of media assemblages in the past, of a shared familial and parental digital media environment. Not the sharp and poignant moments that might be brought to mind by picking up a treasured book or DVD, connected closely to particular birthdays, nights in, sleepovers. Rather, of innumerable and now forgotten moments of frantic searches for a lead that will allow the configuration of some device and media event, of frustration and satisfaction. Of Pokémon games and DVDs, of Mario Kart sessions with a borrowed data projector (birthday parties). A tangled rather than stratified history or timeline, though with truly archaic formats gathering at the bottom: adapter jacks for the old large headphone plugs on hifi systems to allow the now near universal 3.5 mm jack. A mixture of the once-exciting – modems and GameBoy connectors – evidence of a degree of early-adoption and of childhood gifts and novelty – the utterly banal: cheap earbuds that must have come with some old mobile phone but have never been used, multiple USB leads that hint at nothing specific or novel, the one-use analogue cameras that flourished briefly before digital cameras, and then smartphones exploited the contemporary persistent and spontaneous photographic practices they prefigured. A sense of a media childhood now gone (though not mourned), and of a particular (and maybe historically specific) dimension to mediated parenting (or the parenting of mediation): a brief moment – a few years only – in which children’s domestic environments (for play, education, sociality) were plugged in, connected, networked rather than either – as before – decorated with posters, populated with books and toys, or – as now – laced together with the invisible tracery of wifi and bluetooth, 4G and cross-platformed and cloud-sustained apps. The trace of decades in a cats-cradle tangle of black wires, a puzzle of jacks and plugs leading into the tangle, knotting together years, generations, love, birthdays, boredom, games and films both favourite and forgotten.